At the base of axons sits a unique compartment called the axon initial segment (AIS). The AIS generates and shapes the action potential before it is propagated along the axon. Neuronal excitability thus depends crucially on the AIS composition and position, and these adapt to developmental and physiological conditions. The AIS also demarcates the boundary between the somatodendritic and axonal compartments. Recent studies have brought insights into the molecular architecture of the AIS and how it regulates protein trafficking. This Viewpoints article summarizes current knowledge about the AIS and highlights future challenges in understanding this key actor of neuronal physiology. Neurons ensure the directional propagation of signals throughout the nervous system. The functional asymmetry of neurons is supported by cellular compartmentation: the cell body and dendrites (somatodendritic compartment) receive synaptic inputs, and the axon propagates the action potentials that trigger synaptic release toward target cells. Between the cell body and the axon sits a unique compartment called the axon initial segment (AIS). The AIS was first described 50 years ago (Palay et al., 1968), and its molecular composition and organization have been progressively elucidated during the following decades (Rasband, 2010a). Studies have delineated the mechanisms driving its formation and maintenance, as well as its modification in different physiological and pathological contexts (Grubb et al., 2011; Petersen et al., 2016; Yamada and Kuba, 2016). 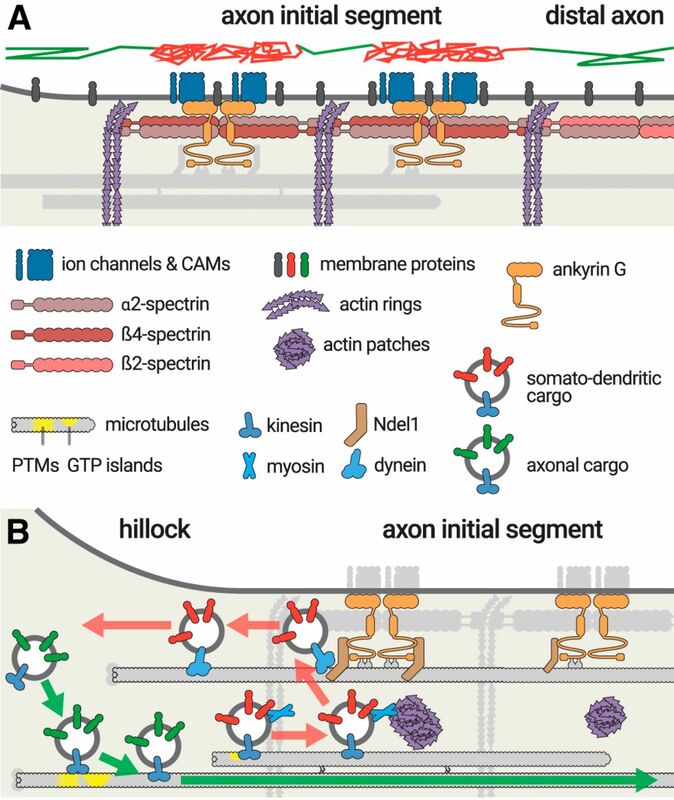 Recent years have also brought crucial insights into the functions of the AIS: how ion channels at its surface generate and shape the action potential (Clark et al., 2009; Kole and Stuart, 2012), and how its specialized scaffold regulates protein trafficking between the cell body and the axon (Leterrier and Dargent, 2014; Nirschl et al., 2017). This Viewpoints article aims to provide an up-to-date summary of these aspects, familiarizing nonspecialists with this unique neuronal compartment and reviewing the latest results in this actively evolving field. Numerous, likely subjective, choices have been made to keep this Viewpoints article short and synoptic, and the interested reader will find additional details in several recent reviews (Jones and Svitkina, 2016; Leterrier, 2016; Zhang and Rasband, 2016; Nelson and Jenkins, 2017). In most neurons, the AIS is present along the first 20–60 μm of the axon shaft (Fig. 1). The AIS usually starts just after the axon hillock close to the cell body, but sometimes more distally, for example, when the axon emerges as a branch from a proximal dendrite (Thome et al., 2014; Höfflin et al., 2017). In electron microscopy studies, the AIS was initially defined by three unique morphological features: closely apposed bundles of 3–10 microtubules called fascicles, a ∼50-nm-thick undercoat lining the plasma membrane, and an almost complete absence of ribosomes (Palay et al., 1968; Peters et al., 1968). In some neuron types, the AIS also contains postsynaptic specializations connected to GABAergic interneurons (Jones and Powell, 1969; Kosaka, 1980). The AIS. A, A typical neuron receives input on the cell body and dendrites (left). The hillock leads to the axon, which contains the AIS (orange). The distal axon contacts downstream neurons (right). B, Hippocampal neurons after 22 d in culture labeled for the AIS components NF-186 (green) and β4-spectrin (red). The somatodendritic compartment is labeled using an anti-MAP2 antibody (blue). Scale bar, 50 μm. C, Hippocampal neuron after 14 d in culture labeled for actin (gray), β4-spectrin (red), and Nav channels (green). Bottom, The zoomed image represents the AIS. Scale bar, 20 μm. At the molecular level, AIS proteins organize as a layered scaffold spanning from microtubules to the plasma membrane (Leterrier, 2016). The central component of this scaffold is ankyrin G (ANK3), with long isoforms of 480 and 270 kDa that concentrate specifically at the AIS and nodes of Ranvier (Kordeli et al., 1995). Ankyrin G has a modular structure, allowing it to organize the AIS scaffold, with a membrane-binding domain (made of 24 ankyrin repeats), and spectrin-binding, serine-rich, tail and carboxyterminal domains (Fig. 2A) (Bennett and Lorenzo, 2013). The aminoterminal side of ankyrin G is inserted into the actin/spectrin submembrane scaffold. It anchors AIS-specific membrane proteins, including voltage gated sodium (Nav) and potassium (Kv) channels and two cell adhesion molecules (CAMs): the 186 kDa isoform of neurofascin 186 (NF-186) and NrCAM (Davis et al., 1996). The ankyrin G carboxyterminal side connects this submembrane scaffold to microtubules via interactions with microtubule-associated proteins, such as EB1/3 and Ndel1 (Leterrier et al., 2011; Kuijpers et al., 2016). Molecular structure of ankyrin G and AIS spectrins. A, Domain organization of ankyrin G, which exists as isoforms of 480 and 270 kDa at the AIS (top, orange). Important residues (red) and EB-binding SxIP motifs (blue) are indicated. Binding sites of partners are indicated below the protein (gray bars). B, Domain organization of β4-spectrin, which exists as isoforms of 280 and 140 kDa (left), and domain organization of α2-spectrin (right). Binding sites of partners are indicated below the protein (gray bars). Bottom, Structure of the α2/β4 spectrin tetramer. N and C indicate the aminoterminus and carboxyterminus, respectively, of each subunit. C, The AIS submembrane complex. The α2/β4 spectrin tetramers (red) lie horizontally under the plasma membrane (dark gray), connecting actin rings (purple) with a distance of ∼190 nm. In the middle of the tetramer, ankyrin G (orange) is bound to β4-spectrin and anchors AIS membrane proteins (Nav/Kv7 channels, CAMs, blue). The actin/spectrin submembrane complex is present along the whole axonal plasma membrane (or axolemma). In the AIS and nodes of Ranvier, spectrin tetramers contain the β4-spectrin subunit (Fig. 2B) (Berghs et al., 2000). 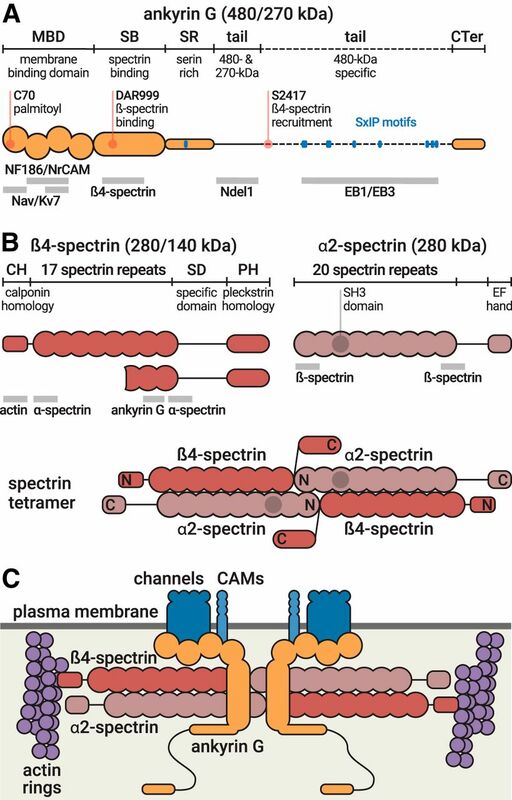 The full-length, 280 kDa isoform of β4-spectrin (β4∑1) contains an actin-binding calponin-homology domain, 17 triple-helical spectrin repeats, and a specific pleckstrin-homology domain (Bennett and Lorenzo, 2013). A shorter, 140 kDa β4∑6 isoform lacks the actin-binding domains and repeats 1–9 (Komada and Soriano, 2002). This shorter isoform becomes progressively enriched as the AIS matures (Yoshimura et al., 2016). Spectrins are head-to-head tetramers composed of two α and two β subunits (Fig. 2B). 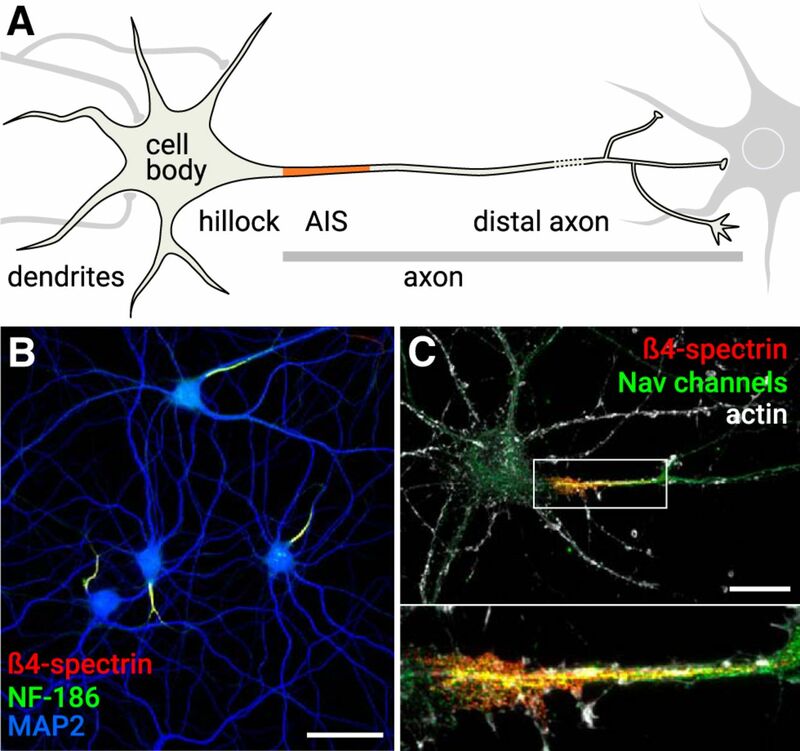 The α2-spectrin subunit, expressed throughout neurons, has recently been identified as the α-spectrin partner of β4-spectrin at the AIS and nodes of Ranvier (Huang et al., 2017a, b). Interaction with ankyrin G drives the concentration of β4-spectrin at the AIS (Dzhashiashvili et al., 2007; Yang et al., 2007). Spectrin repeats 14–15 of β4-spectrin bind to the ankyrin G spectrin-binding domain (Komada and Soriano, 2002). A second site in the tail of the 480 kDa ankyrin G is also implicated in its recruitment at the AIS (Jenkins et al., 2015). Using super-resolution microscopy, the actin/spectrin submembrane complex in axons was shown to be periodically organized with actin rings connected by tetramers of spectrin (Figs. 2C, 3A) (Xu et al., 2013; D'Este et al., 2015; Leterrier et al., 2015). This periodic scaffold is composed of actin and tetramers of α2- and β4-spectrin at the AIS, while β2-spectrin replaces β4-spectrin along the distal axon (Zhong et al., 2014; Huang et al., 2017a). The ∼190 nm distance between actin rings, just below the ∼250 nm diffraction limit of epifluorescence microscopy, corresponds to the length of individual spectrin tetramers (Bennett et al., 1982). Indeed, spectrin tetramers connect adjacent actin rings: the aminotermini of the two β-spectrin subunits colocalize with actin rings, whereas their carboxytermini and the two aminotermini of α2-spectrin are found halfway between rings (Fig. 2C) (Zhong et al., 2014; Huang et al., 2017a). In the AIS, ankyrin G binds to the center of the spectrin tetramer, thus positioning the ankyrin G/channels/CAMs complex midway between actin rings (Xu et al., 2013; Leterrier et al., 2015; D'Este et al., 2017). In the more distal axon, the periodic complex contains α2/β2-spectrin and anchors ankyrin B rather than ankyrin G between the actin rings (Xu et al., 2013; Zhong et al., 2014). 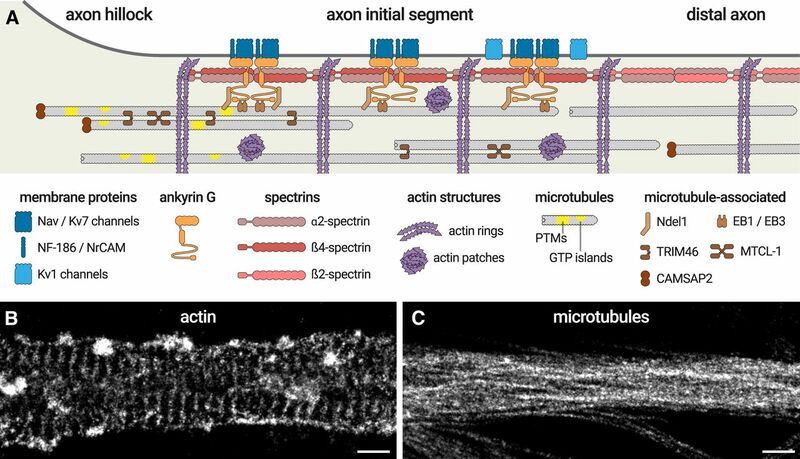 The periodic actin/spectrin scaffold is crucial for the robustness of axons, helping them flex and resist mechanical constraints (Krieg et al., 2014, 2017; Zhang et al., 2017). The resulting periodic organization of Nav and Kv channels (Xu et al., 2013; Leterrier et al., 2015) could also affect action potential generation and conduction, although this has yet to be demonstrated. The molecular organization of the AIS. A, Diagram depicting the organization of the AIS scaffold. Membrane proteins (Nav/Kv7 channels, NF-186, NrCAM, blue) are anchored by ankyrin G (orange), itself inserted into the α2/β4-spectrin complex (red) that spaces actin rings (purple). Kv1 channels (light blue) are present along the distal AIS. In the distal axon, the complex is made of α2- and β2-spectrin (pink). Ankyrin G binds to microtubules via EB1/EB3 proteins and Ndel1 (brown). AIS microtubules (gray) are capped by CAMSAP2 at their minus-end (brown) and grouped in fascicles crosslinked by TRIM46 and possibly MTCL-1 (brown). They are enriched in post-translational modifications (PTMs) and GTP islands (yellow). Intracellular patches of actin (purple) are also present inside the AIS. B, The <50 nm resolution of stochastic optical reconstruction microscopy (STORM) makes it possible to resolve the 190 nm spacing of actin rings and the presence of actin patches along the AIS. C, STORM can resolve microtubule bundles along the AIS, but the close apposition within bundles (∼30 nm spacing) makes it a challenge to distinguish individual microtubules. Scale bars: B, C, 0.5 μm. The periodic actin/spectrin scaffold appears just after axonal specification, before the assembly of the AIS (Zhong et al., 2014); this shines a new light on the timing and hierarchy of component recruitment during AIS formation. Ankyrin G clusters along the proximal axon early during development: after 3–4 d in neuronal cultures, and between embryonic day 13.5 and postnatal day 1 in vivo depending on the neuronal type (Galiano et al., 2012; Gutzmann et al., 2014; Le Bras et al., 2014). Ankyrin G then recruits other AIS components: ion channels, CAMs, and β4-spectrin (Zhou et al., 1998; Jenkins and Bennett, 2001; Hedstrom et al., 2007). The full-length 480 kDa ankyrin G is necessary for this recruitment and the formation of the AIS, whereas the role of the shorter 270 kDa isoform is less clear (Fig. 2A) (Jenkins et al., 2015; Fréal et al., 2016). Binding of ankyrin G to the plasma membrane, via membrane protein partners or palmitoylation of its membrane-binding domain, promotes its recruitment and stability at the AIS (He et al., 2012; Leterrier et al., 2017a). In cortical neurons, the clustering of ankyrin G occurs after ankyrin B and β2-spectrin assembly along the distal axon, directing the subsequent anchoring of the ankyrin G/β4-spectrin complex along the remaining proximal axon submembrane (Galiano et al., 2012; Normand and Rasband, 2015). In another study, the actin/β2-spectrin periodic scaffold was shown to assemble along the proximal axon after only 2 d in vitro and was not found along the distal axon until later stages (Zhong et al., 2014). This presence of the actin/β2-spectrin scaffold before the appearance of ankyrin G at the nascent AIS suggests that β2-spectrin could be later replaced or supplemented by β4-spectrin within the periodic scaffold (Zhong et al., 2014). An interplay between β2-spectrin and ankyrin G could thus be an early event of AIS formation, but the exact hierarchical and temporal sequence remains to be established. Ankyrin G recruits and anchors ion channels (Nav, Kv7) and CAMs (NF-186, NrCAM) via several binding sites in its membrane-binding domain (Wang et al., 2014). Ankyrin G binds to an interaction motif within the II-III intracellular loop of Nav channels (Srinivasan et al., 1988; Garrido et al., 2003; Lemaillet et al., 2003; Gasser et al., 2012). This results in an ∼30-fold concentration of Nav channels in the AIS compared with in the dendrites or distal axon (Kole et al., 2008; Lorincz and Nusser, 2010). The Nav channel composition of the AIS depends on the developmental stage and on the neuronal type, with Nav1.6 being the dominant type in mature neurons (Inda et al., 2006; Van Wart et al., 2007; Lorincz and Nusser, 2008; Duménieu et al., 2017). Nav channels are primarily responsible for the initiation of action potentials at the AIS (Clark et al., 2009; Kole and Stuart, 2012). The pore-forming Nav α is often associated with Nav β subunits, with a reported AIS concentration of Nav β1 and Nav β4 (Hull and Isom, 2017), and they are regulated by fibroblast growth factor homologs FHF1–4/FGF12–14 (Dover et al., 2016; Pablo et al., 2016). Voltage-gated potassium (Kv) channels are also present at the AIS, forming distinct complexes. Kv7.2 and Kv7.3 channels (KCNQ2/KCNQ3) concentrate at the AIS by binding to ankyrin G through a Nav-homologous motif in their carboxyterminal tail (Pan et al., 2006; Cooper, 2011; Xu and Cooper, 2015). They generate the M current that restricts intrinsic firing and excitability (Shah et al., 2008). Kv1.1 and Kv1.2 associate with PSD-93, Caspr2, Tag1, and ADAM22 at the AIS (Ogawa et al., 2008), where they modulate action potential firing and waveform (Kole et al., 2007). This complex is not bound to ankyrin G, and how it localizes at the AIS remains unclear (Rasband, 2010b). Interestingly, Kv1.2 channels cluster at actin rings, rather than in-between them (D'Este et al., 2017). Kv2.1 channels are also found at the AIS, where they form distinct, large ankyrin G-negative clusters (Sarmiere et al., 2008; King et al., 2014; Jensen et al., 2017). Several mechanisms underlie the targeting of ion channels to the AIS (Leterrier et al., 2010). Chimera constructs bearing the Nav1.2 ankyrin-binding motif are delivered nonspecifically to the plasma membrane in all compartments, then are selectively endocytosed in the cell body, dendrites, and distal axon, leaving only those in the AIS (Fache et al., 2004). This “negative” targeting likely happens during the dynamic phase of AIS formation. At later stages, a direct insertion of Nav channels occurs at the assembled AIS (Akin et al., 2015), cotransported with ankyrin G (Barry et al., 2014; Leterrier et al., 2017a). Kv1 channels are targeted to the axon and the AIS through association of the Kvβ2 subunit with the microtubule end-binding protein EB1 and kinesin-2 (Vacher et al., 2011), and a Golgi-independent pathway directs a specific fraction of Kv2.1 channels to the AIS (Jensen et al., 2017). Once channels are anchored at the AIS, their diffusion and turnover are limited (Angelides et al., 1988; Brachet et al., 2010; Akin et al., 2015; Benned-Jensen et al., 2016). Although they are not required for AIS formation (Dzhashiashvili et al., 2007; Hedstrom et al., 2007; but see Xu and Shrager, 2005), depletion of ion channels and CAMs affects the integrity of the assembled AIS (Zonta et al., 2011; Leterrier et al., 2017a). A key feature of the assembled AIS scaffold is thus the interdependence between components, a feature that could facilitate its plasticity. While the aminoterminus of ankyrin G is inserted in the actin/spectrin submembrane scaffold, anchoring ion channels and CAMs, its carboxyterminal side extends ∼35 nm toward the cytoplasm (Fig. 3A) (Leterrier et al., 2015). The numerous SxIP motifs present in the tail domain of ankyrin G (Fig. 2A) allow binding to microtubules via EB1 and EB3 proteins (Fréal et al., 2016). In contrast to their classical role as microtubules plus-end organizers (van de Willige et al., 2016), EBs concentrate along the microtubule lattice at the AIS (Nakata and Hirokawa, 2003; Leterrier et al., 2011). The interplay between EBs and ankyrin G is necessary for both the formation and maintenance of the AIS scaffold (Leterrier et al., 2011; Fréal et al., 2016). The recruitment of microtubules ∼50–100 nm under the plasma membrane by ankyrin G and EBs could be important for organizing trafficking into the axon (see below). Axonal microtubules have a uniform orientation with their plus-ends toward the axon tip (Fig. 3A) (Baas and Lin, 2011; Yau et al., 2016). In the AIS, they are grouped in fascicles, a feature that depends on ankyrin G (Fig. 3B) (Sobotzik et al., 2009). This unique organization depends on the presence of several microtubule-associated proteins (MAPs) that have been recently identified at the AIS. CAMSAP2, a member of the CAMSAP/patronin minus-end binding protein family (Akhmanova and Hoogenraad, 2015), is present at the axon hillock (just before the AIS) and is important for the establishing uniform orientation of microtubules in the axon (Yau et al., 2014). TRIM46 is associated with proximal AIS microtubules, and it is important for axon specification, uniform microtubule orientation, and AIS assembly. Its microtubule-bundling activity could drive the formation of microtubule fascicles (van Beuningen et al., 2015). Another microtubule-associated protein, MTCL-1, also associates with microtubules within the proximal AIS and has a stabilizing role (Satake et al., 2017). The biochemical characteristics of microtubules at the AIS are also unique (Fig. 3A). They are rich in post-translational modifications (Janke, 2014), such as tubulin acetylation, detyrosination, and polyglutamylation (Konishi and Setou, 2009; Hammond et al., 2010; Tapia et al., 2010). These modifications progressively accumulate as the microtubules age, which is consistent with the observed stability of AIS microtubules (Baas et al., 1993; Hammond et al., 2010; but see Zempel et al., 2017). Microtubules polymerize from GTP-tubulin, but the GTP is rapidly hydrolyzed into GDP after assembly, leaving only a short cap of GTP-tubulin at the growing microtubule tip (Brouhard, 2015). However, short stretches of GTP-tubulin can be found along the microtubule lattice; these either remain after tip assembly (Dimitrov et al., 2008) or are formed later by in-lattice microtubule repair (Aumeier et al., 2016). These GTP islands are abundant along the axon hillock and AIS (Nakata et al., 2011), and they might participate in EB accumulation, given that EB1 and EB3 have a preferential affinity for GTP-tubulin (Maurer et al., 2012). Depletion of ankyrin G, by shRNA or gene knock-out, has a profound effect on the proximal axon composition: AIS components are not recruited (Zhou et al., 1998; Jenkins and Bennett, 2001; Hedstrom et al., 2007) or lose their localization (Hedstrom et al., 2008; Leterrier et al., 2017a). Moreover, the proximal axon of ankyrin G-depleted neurons is progressively invaded by somatodendritic-specific proteins, such as MAP2, KCC2, and integrin β1 (Hedstrom et al., 2008; Franssen et al., 2015; Jenkins et al., 2015), and ectopic spines containing excitatory postsynaptic components form along the AIS (Hedstrom et al., 2008; Sobotzik et al., 2009). Thus, the AIS acts as a boundary between the somatodendritic and axonal compartments and maintains the distinct molecular identity of the axon (Rasband, 2010a). Two processes potentially contribute to this role: a surface diffusion barrier segregating the somatodendritic and axonal membrane proteins and an intracellular filter regulating vesicular transport as well as cytosolic diffusion between the cell body and the axon (Leterrier and Dargent, 2014; Huang and Rasband, 2016; Nirschl et al., 2017). The high concentration of membrane proteins anchored at the AIS (Matsumoto and Rosenbluth, 1985) was proposed to create an AIS “barrier” maintaining the distinct composition between the somatodendritic and axonal plasma membrane (Dotti and Simons, 1990). Indeed, ankyrin G-bound channels and CAMs are strongly immobilized at the AIS (Nakada et al., 2003; Boiko et al., 2007; Brachet et al., 2010), and membrane protein diffusion through the AIS is restricted (Fig. 4A) (Winckler et al., 1999). Membrane lipids only slowly diffuse between the cell body and axon (Kobayashi et al., 1992), and single particle tracking shows that they are less mobile at the AIS than in the cell body or the more distal axon surface (Nakada et al., 2003). These findings led to the “picket and fences” model of the AIS diffusion barrier: diffusion of membrane proteins and lipids is hampered by picket membrane proteins (channels and CAMs) bound to submembrane fences (ankyrin G/spectrin/actin scaffold) (Nakada et al., 2003). Protein trafficking at the AIS. A, The AIS forms a diffusion barrier for membrane proteins and lipids (gray). A virtual trajectory (top) shows unimpaired diffusion at the cell body and distal axon (green segments), whereas diffusion at the AIS is limited by the AIS scaffold (red segments). B, Sorting of transport vesicles at the AIS entrance. Vesicles containing axonal cargoes (green) have kinesin motors (blue) that recognize cues on microtubules entering the axon, either post-translational modifications or GTP islands (yellow), before being transported into the axon (green arrow). Somatodendritic cargoes that start progressing into the AIS (red) are stopped by myosin-mediated immobilization at actin patches, before being brought back to the cell body by Ndel1-dependendant dynein transport (red arrows). How does the “pickets and fences” model accommodate the periodic alternation of actin rings and ankyrin G/membrane-protein complexes spaced along spectrin tetramers (Xu et al., 2013)? Surprisingly, submembrane actin rings, rather than the ankyrin G/membrane-proteins complex, seem to compartment the diffusion of a membrane-bound probe along the AIS (Fig. 4A) (Albrecht et al., 2016). A possible explanation is that the “pickets” formed by ankyrin-bound membrane proteins restrict diffusion not by excluding the passage of membrane components, but by capturing and slowing them down within a dense “forest,” similar to what was proposed at the postsynaptic membrane (Renner et al., 2009; Li and Blanpied, 2016). This would also explain why surface diffusion is not affected in the axon shaft beyond the AIS, as it lacks the dense array of ankyrin/spectrin-bound membrane proteins. The regulation of intracellular trafficking at the AIS has been hotly debated since it was initially proposed (Song et al., 2009). Intracellular trafficking includes diffusion of soluble macromolecules through the AIS axoplasm and active vesicular transport of membranous organelles and vesicles. Regarding the former, an actin-based cytoplasmic sieve has been proposed to impede diffusion between the cell body and the axon, with a mesh size estimated at 13 nm (Song et al., 2009; Sun et al., 2014). However, fluorescence and electron microscopy do not show a dense accumulation of actin inside the AIS: actin forms rings connected by spectrin, as in the rest of the axon (Xu et al., 2013; Leterrier et al., 2015; D'Este et al., 2017), as well as patches made of short intertwined filaments (Fig. 3A,B) (Watanabe et al., 2012; Jones et al., 2014; Leterrier et al., 2017b). Diffusion of the microtubule-associated protein tau is impaired at the AIS in an isoform-dependent manner (Li et al., 2011; Zempel et al., 2017). Altogether the mechanisms of soluble protein diffusion at the AIS are still unclear; studies using controlled assays could bring more clarity, as they did for diffusion in the primary cilium (Breslow et al., 2013; Lin et al., 2013). Vesicular transport through the AIS has long attracted interest, as regulating the entry of cargoes into the axon could have a crucial effect on the establishment and maintenance of polarity (Rasband, 2010a; Bentley and Banker, 2016). Vesicles containing axonal membrane proteins are assembled in the cell body and preferentially trafficked into the axon, with no visible slowing at the AIS (Petersen et al., 2014; Jenkins et al., 2015; Liu et al., 2018), whereas vesicles harboring somatodendritic proteins are excluded from entering the axon, or stall and reverse within the AIS when they do (Burack et al., 2000; Al-Bassam et al., 2012; Petersen et al., 2014). This suggests that a specific sorting process occurs at the AIS entrance (Fig. 4B). A handful of recent studies point to a two-stage mechanism for vesicle recruitment and sorting: (1) direct recruitment or exclusion at the AIS entrance and (2) retrieval of mistargeted cargos within the AIS (Nirschl et al., 2017). Recruitment of axonal vesicles and exclusion of somatodendritic cargoes occurs within the axon hillock at the AIS entrance, a region recently termed “pre-axonal exclusion zone” (Fig. 4B) (Farías et al., 2015). This region overlaps with the TRIM46-positive region that depends on ankyrin G for its proper assembly (van Beuningen et al., 2015). An interesting question is whether axonal cargo recruitment and somatodendritic cargo exclusion are independent of the ankyrin G-based AIS scaffold (Farías et al., 2015; Jenkins et al., 2015). In DRG neurons, that lack the concentration of AIS components, such as ankyrin G, this pre-axonal exclusion also occurs at the axon hillock via a TRIM46/MAP2 based mechanism (Gumy et al., 2017). Vesicular transport is driven by motor proteins (kinesins, dynein), and the AIS might also regulate their recruitment to direct axonal trafficking. Because axonal microtubules have a uniform orientation with their plus-ends out, plus-end-directed motors (i.e., kinesins) drive anterograde transport from the cell body toward the axon tip (Kapitein and Hoogenraad, 2015). A subset of kinesins, most notably the kinesin-1 members KIF5A/B/C, selectively direct transport cargoes into the axon rather than dendrites (Nakata and Hirokawa, 2003; Huang and Banker, 2012; Lipka et al., 2016). The KIF5 motor head is able to recognize and selectively bind microtubules that enter the axon (Nakata and Hirokawa, 2003), but the cue it detects remains elusive. KIF5 could recognize distinct post-translational modifications on axonal microtubules (Konishi and Setou, 2009; Hammond et al., 2010; Tapia et al., 2010). Interestingly, stretches of GTP-tubulin (“GTP islands”) found along microtubules in the AIS have been shown to recruit KIF5 (Nakata et al., 2011). Based on this, I propose a “repair and recruit loop” hypothesis of preferential KIF5 recruitment into the axon. As mentioned above, GTP islands were initially proposed to be remnants from GTP-tubulin polymerization at the microtubule plus tip (Dimitrov et al., 2008; Nakata et al., 2011), but they can instead result from repair of microtubule defects by the incorporation of GTP-tubulin into the lattice (Schaedel et al., 2015; Aumeier et al., 2016). Moreover, such defects might be created by the passage of kinesin motors, which can remove tubulin monomers as they walk along microtubules (Dumont et al., 2015). This would generate a feedback loop to establish preferential transport to the axon: the sustained procession of axonal kinesins induces numerous defects along AIS microtubules, which are subsequently repaired by GTP-tubulin incorporation. This concentration of GTP-tubulin drives the recruitment of more kinesins, causing more defects, repair, and recruitment. An additional sorting mechanism involving retrieval within the AIS ensures that somatodendritic cargoes are not mistargeted to the axon (Fig. 4B). Actin is involved in this process: the actin-based molecular motor myosin V interacts with binding motifs on somatodendritic proteins (Lewis et al., 2009) and immobilizes vesicles at actin patches within the AIS, preventing further transport (Watanabe et al., 2012; Balasanyan et al., 2017; Janssen et al., 2017). Ndel1, a regulator of the microtubule minus-end-directed motor complex dynein, is stably anchored at the AIS by its interaction with ankyrin G (Kuijpers et al., 2016). Ndel1, together with its partner LIS1, can activate dynein-mediated transport to retrieve vesicles stalled at the AIS, and this retrieval is regulated by cdk5-mediated phosphorylation of Ndel1 (Klinman et al., 2017). Another retrieval mechanism involves the activation of dynamin-mediated retrograde transport by Rab5 and its effector FHF (Guo et al., 2016). Thus, AIS retrieval is likely to rely on actin-dependent immobilization followed by dynein-mediated retrograde transport to the cell body, but this sequence has not been directly demonstrated yet. Despite its complex architecture and overall stability, the AIS morphology is finely regulated and can adapt to physiological or pathological cellular changes (Yoshimura and Rasband, 2014; Yamada and Kuba, 2016; Jamann et al., 2018). This includes short-term changes (seconds to minutes) due to channel modulation, or long-term changes (hours to days) implicating morphological changes (Petersen et al., 2016). Fast inhibition of the AIS electrogenic properties is often linked to elevated intracellular calcium. Elevated activity leads to fast endocytosis of Nav and Kv7 channels from the AIS due to calcium entry via NMDA receptors (Benned-Jensen et al., 2016). Entry of calcium can also occur via P2X receptors, downregulating sodium channel currents (Del Puerto et al., 2015), or via Cav3 channels to suppress the M-current driven by Kv7 channels (Martinello et al., 2015). Neuromodulatory transmitters can also regulate channel activity at the AIS. For example, dopamine can inhibit Cav3 channels (Bender et al., 2010; Yang et al., 2016), and serotonin, acting via 5-HT1A receptors, modulates Nav in cortical pyramidal neurons (Yin et al., 2017) and motoneurons (Cotel et al., 2013). Serotonin also modulates HCN channels near the AIS (Ko et al., 2016). The AIS also exhibits long-term changes in morphology, with variations in length and position along the proximal axon (Yamada and Kuba, 2016). During development, the AIS shortens and densifies (Kuba et al., 2014; Le Bras et al., 2014) or lengthens (Galiano et al., 2012) depending on the neuronal type studied. The AIS is stably maintained with age in the rat hippocampus (Kneynsberg and Kanaan, 2017) but shortens in monkeys (Cruz et al., 2009). These variations allow intrinsic excitability to be tuned, and they are linked to the development of inputs: early-life interventions, such as sensory deprivation, can affect this morphological evolution (Gutzmann et al., 2014; Kuba et al., 2014; Nozari et al., 2017; Schlüter et al., 2017). In addition, extrinsic factors, such as BDNF/NT3, can regulate AIS position (Guo et al., 2017). The morphology of the assembled AIS can also adapt in response to changes in activity: diminished activity results in AIS lengthening (Kuba et al., 2010), and elevated activity leads to a distal shift along the axon (Grubb and Burrone, 2010). This morphological plasticity has been observed in neuronal cultures (Grubb and Burrone, 2010; Chand et al., 2015), in organotypic brain slices (Wefelmeyer et al., 2015), in human pluripotent stem cell-derived neurons (Horschitz et al., 2015), and in vivo (Kuba et al., 2010). It is thought to alter intrinsic excitability in a homeostatic direction (Grubb and Burrone, 2010; Wefelmeyer et al., 2016). However, the exact consequence of the AIS lengthening or distal shift on the intrinsic excitability is not trivial, as it depends on the overall morphology of the dendritic arbor (Brette, 2013; Gulledge and Bravo, 2016; Hamada et al., 2016). More subtle effects, such as a switch in ion channel composition between Kv7 and Kv1 (Kuba et al., 2015), antagonistic phospho-dependent regulation of Nav channels (Evans et al., 2015), or separation between the AIS scaffold and inhibitory synapses along the proximal axon (Muir and Kittler, 2014; Wefelmeyer et al., 2015), contribute to the modulation of excitability. A new type of plasticity involving a distal shift has also been observed recently in response to inhibition of Kv7 channel activity (Lezmy et al., 2017). What are the molecular mechanisms of AIS morphological plasticity? Phosphorylation can strengthen or loosen multiple interactions within the AIS scaffold, providing a starting point for morphological changes. Protein kinase CK2 regulates the interaction between ankyrin G and Nav as well as Kv7 channels (Bréchet et al., 2008; Hien et al., 2014; Xu and Cooper, 2015), and it is implicated in Kv7-mediated plasticity (Lezmy et al., 2017). The kinase Cdk5 is implicated in regulating AIS length (Trunova et al., 2011; Chand et al., 2015), and the phosphatase calcineurin drives the distal shift in response to elevated activity (Evans et al., 2013), but in both cases the target and precise site of action are unknown. Other kinases, such as CaMKII (Hund et al., 2010) and GSK3β (Tapia et al., 2013), are anchored to the AIS scaffold, but their role in regulating the scaffold remains elusive. Degradation of AIS components could also play a role in morphological plasticity, as calpain can degrade AIS components after ischemic injury or excitotoxic events (Schafer et al., 2009; Del Puerto et al., 2015; Benned-Jensen et al., 2016). Changes in the AIS position must ultimately be driven by cytoskeletal adjustments. Actomyosin contractility has been implicated in this process (Evans et al., 2017), and the distal shift caused by hyper-phosphorylated tau suggests microtubule involvement as well (Hatch et al., 2017). A structural understanding of AIS morphological plasticity awaits future studies. New insight may come from studies in genetically tractable organisms, such as Drosophila, where the proximal axon has recently been shown to possess trafficking-related features of the mammalian AIS (Trunova et al., 2011; Rolls and Jegla, 2015; Jegla et al., 2016). Finally, plasticity and alteration of AIS components are implicated in a variety of nervous system pathologies, such as epilepsy (particularly forms caused by mutations in AIS-concentrated ion channels), neurodegeneration (Sun et al., 2014; Tsushima et al., 2015; Zempel et al., 2017), neuroinflammatory/demyelinating diseases (Hamada and Kole, 2015; Clark et al., 2016; Benusa et al., 2017), and bipolar disorders and schizophrenia (Luoni et al., 2016; Kloth et al., 2017; Lopez et al., 2017; Zhu et al., 2017). A complete overview of AIS involvement in pathological situations is beyond the scope of this Viewpoints article; in addition to the latest studies cited above, the interested reader is referred to several comprehensive reviews (Wimmer et al., 2010; Buffington and Rasband, 2011; Hsu et al., 2014). In conclusion, the AIS is a complex assembly of membrane proteins, scaffold proteins, and cytoskeletal adaptors. It has key roles in neuronal physiology, as it drives excitability and maintains polarity. It is exquisitely regulated and can adapt its composition and morphology during development and adult life. I would like to finish by highlighting a couple of key cell biology questions about the AIS that are still unresolved. The first one is the exact mechanism(s) for trafficking of cargoes at the axon entrance. Advances have been made recently, but the puzzle still lacks a few important pieces: How is the sequence of traffic events coordinated? Are all microtubules within the axon hillock and the AIS equivalent or are there different populations for anterograde, retrograde, short and long distances transport? The second question is the structural mechanisms underlying AIS morphological plasticity. When the position of the AIS changes along the axon, does the AIS slide as a whole or does it disassemble and reassemble at its extremities? Is the position of the AIS driven by the submembrane actin scaffold via contractility mechanisms or by intracellular interactions between ankyrin G and microtubules? Future work will undoubtedly shed light on these questions and buttress the crucial role of the AIS in neuronal organization and function. I thank Amélie Fréal for stimulating discussions; and Subhojit Roy and Marie-Jeanne Papandréou for feedback on the manuscript. (2017) Aging does not affect axon initial segment structure and somatic localization of tau protein in hippocampal neurons of Fischer344 rats. 4:ENEURO.0043–17.2017. (2014) Structural basis of diverse membrane target recognitions by ankyrins. Elife 3.